By January 2019 this page had grown to 125 photos and diagrams. It had become rather large (ca. 18 MB download size), which caused long download times for some users. I decided to split the page in two: general introduction and printers remain on this page, other equipment items have moved to a separate page. Please continue using the (unchanged) items lists above, and update your bookmarks. 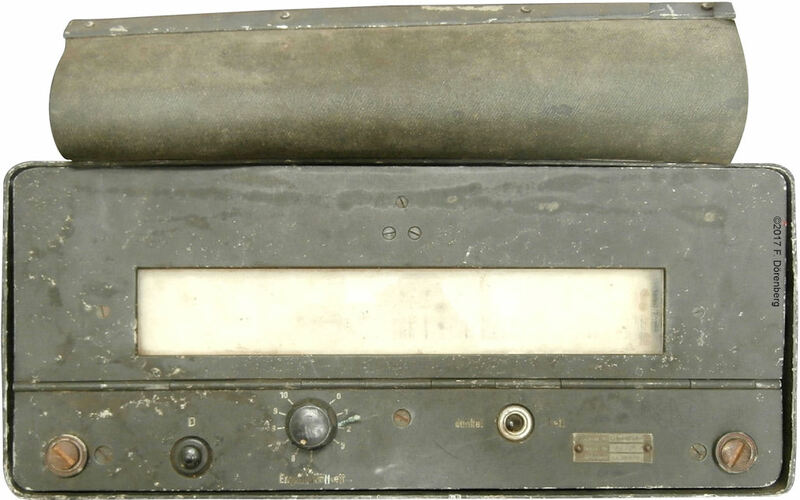 The FuG 120 "Bernhardine" printer system is the airborne counterpart of the FuSAn 724/725 "Bernhard" radio-navigation beacon of the Luftwaffe, 1941-45. It uses the standard on-board EBL3 VHF receiver that was already used with other beacon systems during "blind" approach and landing, and in combination with beam systems for guiding bombers and fighter aircraft to their target. 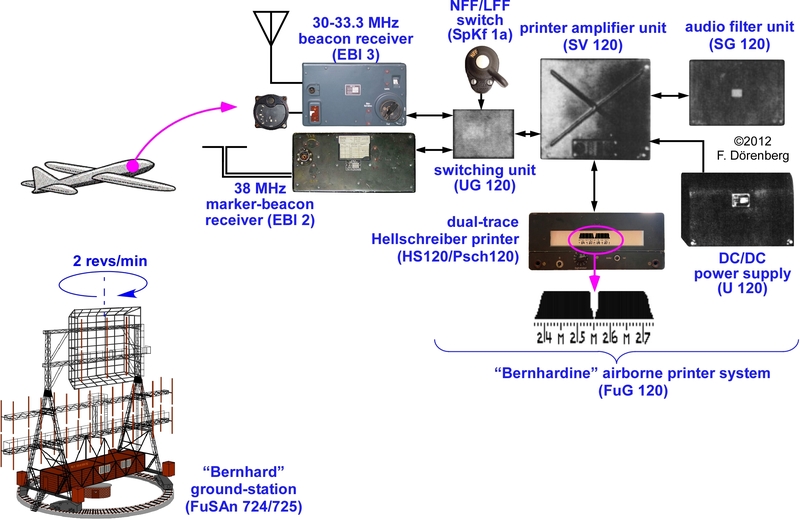 The printer system provided the operator with the bearing from the selected "Bernhard" ground station, and could also receive short "Reportage" text messages with information about enemy aircraft. The official German designation says it all: the FuG 120 is a "UKW-Richtstrahl-Drehfunkfeuer-Empfangszusatz mit Kommandoübertragung". That is, a VHF directional rotating-beam receiver-accessory with command data-link. HS120 dual-trace Hellschreiber printer ("Hell-Schreiber") or Psch 120 ("Peilschreiber" = bearing-printer, also a Hellschreiber). According to ref. 44 (p. 188), most of these equipment items date back to 1941, with the exception of SpKf1a (1942), Psch 120 (1942), and SV 120 (1944). However, ref. 3 suggests that series production did not start until 1943, and also states that the first "Bernhard" ground stations were built in 1942. Fig. 2: Test rack with FuBl 2 navigation receiver system (left) and rack with FuG 120 "Bernhardine"
ZLK VIII S 3, "Zwischenleitungskupplung": splitter/coupler unit. The equipment items UG120, SV120, U120, as well as the installation items RDFS 120, UF120, SGF 120, RSV 120, and VD 120, were all manufactured by a Telefunken plant in Berlin-Zehlendorf (same part of Berlin as the Hell company) or in Erfurt. The associated 3-letter military manufacturer code is "bou". The SG 120 filter unit was manufactured by Siemens Luftfahrtgerätewerk (LGW) Hakenfelde GmbH, manufacturer code "eas". The SpKf1a mode-switch and the ZLK VIII S 3 coupler-unit were made by Frieseke & Höpfner, Spezialwerke für Flugfunktechnik in Berlin Potsdam-Babelsberg and in Breslau. Their manufacturer code was "gqd" (p. 188 in ref. 51). The total weight of the FuG 120 units (incl. mounting frames) is about 38 kg (84 lbs). PGst 120, Prüfgestell, a test rack (possibly such as shown in Figure 2 above). 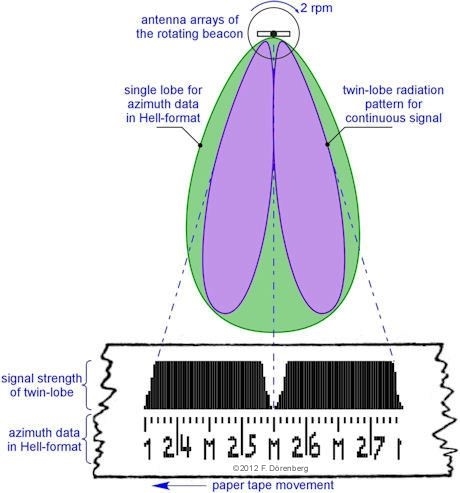 One antenna array (purple in Figure 3) has a radiation pattern with two narrow lobes. There is a steep null between the lobes. This antenna transmits a constant 1800 Hz tone signal. The radiation pattern of the second antenna array has a single lobe (green in Figure 3). Its maximum coincides with the null of the twin-lobe beam. This antenna continuously transmits the direction in which the antenna is pointing (azimuth, bearing from the beacon) in Hellschreiber format, with 2600 Hz tone pulses. However, this transmitter operates at a frequency that is 10 kHz higher than that of the constant-tone transmitter. The lower track prints the azimuth value of the single-beam signal, as the rotating beam illuminates the aircraft for several seconds during each revolution of the antenna system. This is a two-digit value for every ten degrees of azimuth. 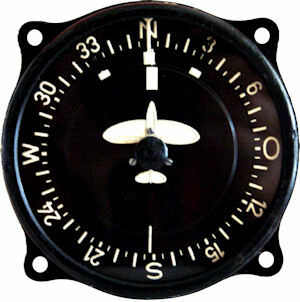 This also standard for identifying the magnetic heading of runways at aerodromes, and in general for compass scales. There is a tick mark for each degree. A station-identifier letter is printed every 10 degrees ("M" in Figure 3). The upper track prints the (clipped) signal strength of the received continuous signal of the twin-beam antenna. Hence, the printed pattern shows the two lobes of that twin-beam, with the sharp null in between. This accurate V-shaped null points at the exact azimuth value that is printed in the lower track (255.0° and 228.0°, respectively, in Figure 3). To the best of my knowledge, no original "Bernhard" audio recordings exist. So I have simulated the sound of a transmission. The recording below comprises two beam-passages: once without the information in Hellschreiber-format (i.e., only the 1800 Hz tone of the twin-lobe beam), and once the 1800 Hz tone plus the constant stream of 2600 Hz Hellschreiber tone-pulses. The simulated beam-passage duration is about 3½ seconds (≈40°). Your browser (or settings) does not support HTML5 or Flash. Use your own player with one of these files (or download them) .wav, .mp3, or .ogg. I have captured the development time-line of the "Bernhardine" printer in tabular form in ref. 204R, based on ref. 204A - 204Q. It all started early 1935, well before WW2: Herbert Muth of the Telefunken company came up with the idea to print the signals of rotating beacons, instead of using a needle-instrument. He also proposed to use the Hellschreiber printer system to do so (ref. 204E/R). The time-line from idea to series production spans well over six years: from early 1935 to at least the fall of 1941. In parallel with the development activities, Telefunken (Adalbert Lohmann, Herbert Muth) and Rudolf Hell patented several fundamental innovations, as illustrated in the time-line diagram of Fig. 5 below. Note that a number of the patents have a post-war patent award date. However, they were actually awarded as "secret patents" before the end of the war, due to their military strategic importance. During the spring of 1935, the Telefunken company decided to develop the "Telefunken-Drehfunkfeuerverfahren", a new Telefunken rotating radio-navigation beacon system (ref. 181, 183). Construction of a UHF test/evaluation beacon started in August of 1935. The beacon used a single transmitter, and the sweeping antenna radiation pattern had two strong front lobes with a sharp null between them. This makes it easy to very accurately detect beam passage. 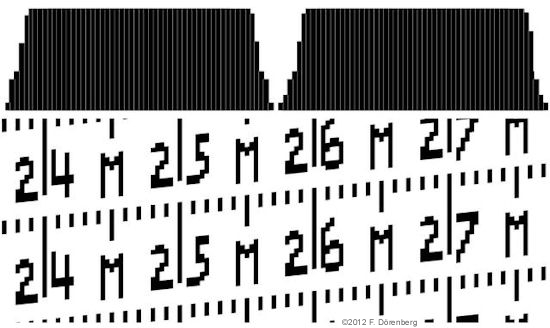 The printing concept was demonstrated with a 1-channel ink strip-chart recorder. Experiments and tests were conducted during December of 1935. 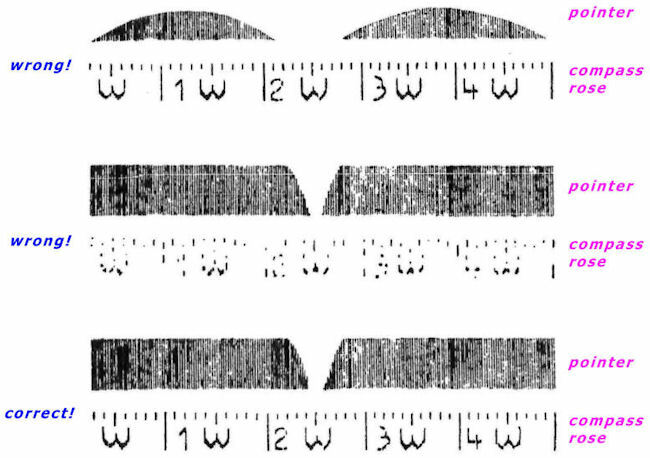 Telefunken's evaluation tests exposed a major problem: Yes, passage of the beacon's beam can be detected accurately, due to the sharp null of the beam. But obviously, during the passage of that null, no signal is (nor can be) received from the beacon. So, that same beam cannot be used to transmit bearing information! Bearing (azimuth) is the direction of the receiver with respect to the beacon, relative to North at the beacon. Exactly when the null of the beacon's beam points at the receiver, the pointing direction of the null is identical to the bearing of that receiver. The solution is covered by the March 1936 Telefunken/Lohmann patent 767354. It expands the original single-transmitter/twin-lobe rotating beam beacon with a second transmitter. It uses a single-lobe beam pattern that points exactly in the null direction of the twin-lobe beam. Both beams rotate simultaneously. The single-lobe beam was used to continuously transmit the momentary pointing direction of the single-beam/null as a sequence of Morse-like dashes and dots ("Kennzeichen"). The RLM (Reichsluftfahrtministerium, the German Aviation Ministry) ordered three test stations early 1936. The printers were 2-channel wax paper strip-chart recorders, custom made by the Siemens Messgerätewerk (Wernerwerk M, M-Werk), see Fig. 6. These are thermal recorders: the strip of paper is waxed (or treated with paraffin) so that it turns black when heated. The printing stylus is small loop of heated resistance wire. Strip chart recorders have a long strip of paper that is ejected out of the recorder. Roll chart recorders are similar to strip chart recorders, except that the recorded data is wound onto roll (like a "reel to reel" audio or video tape recorder), and the unit is usually fully enclosed. Validation testing (including flight tests) of the beacon + printing system was completed about a year later (i.e., spring 1937). The RLM decided to relax its very challenging 0.1° system accuracy requirement, but now required a print-out that was easy to read and interpret (which was not at all the case with the evaluated test systems). Telefunken/Lohmann then took up the 1935 idea of Telefunken/Muth, and proposed to transmit the momentary compass pointing direction of the single-lobe beam in Hellschreiber format, i.e., as bitmap symbology that is transmitted as a stream of binary pixels. However, a method for using a Hellschreiber printer to print the signal strength curve of the twin-lobe "pointer" beam ("Leitstrahl") remained to be found... Telefunken discussed the problem with Rudolf Hell, who then invented the Pulse Width Modulator (PWM), synchronized to the printer spindle of the Hellschreiber printer, to convert the momentary signal amplitude into the length of a vertically printed line segment. I.e., a Hellschreiber bar graph representation. Hell patented this in October of 1937 (patent 730625). During the summer and fall of 1937, the Rudolf Hell Co. designed and built a PWM printer amplifier. 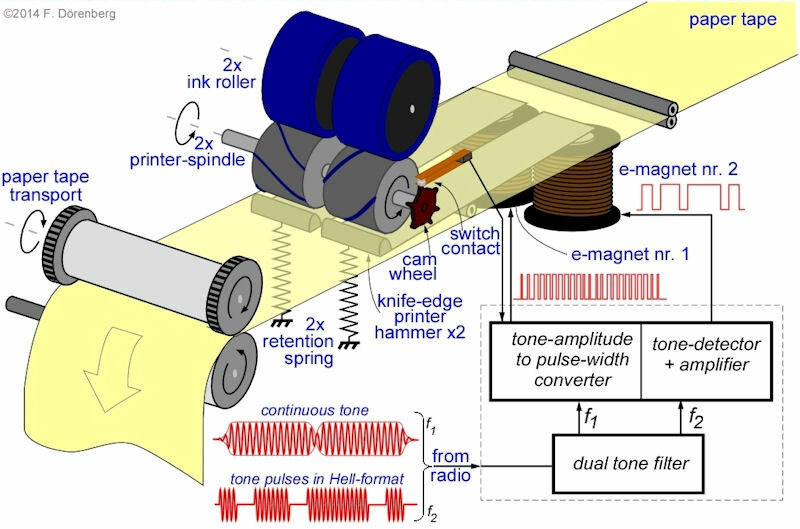 They also modified the printer spindle of a standard Hell Morse practice recorder to interface with the PWM, and print six bars per spindle revolution. The first flight test demonstration (to the RLM) with a Hellschreiber beacon-printer took place on November 11th, 1937 (ref. 204E/F/N). Unfortunately, no photo is available of the Hellschreiber printer that was used. 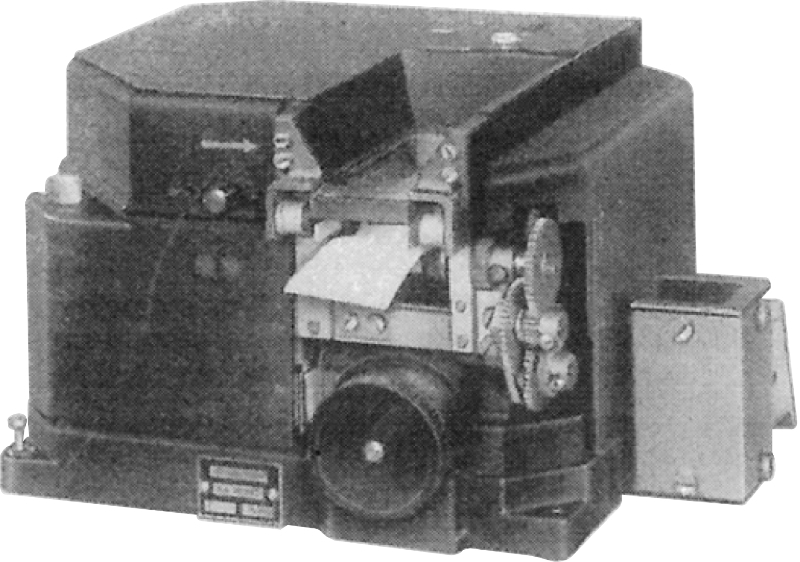 During the fall of 1937, Telefunken/Lohmann conceived and promoted the idea of not using plain paper tape in the Hellschreiber beacon printer, but "Printator" tape. This is 3-layer tape that is erasable by separating the layers. He obtained strips of such tape from the Printator company in Berlin, and presented the idea to Rudolf Hell at his lab on November 24th. 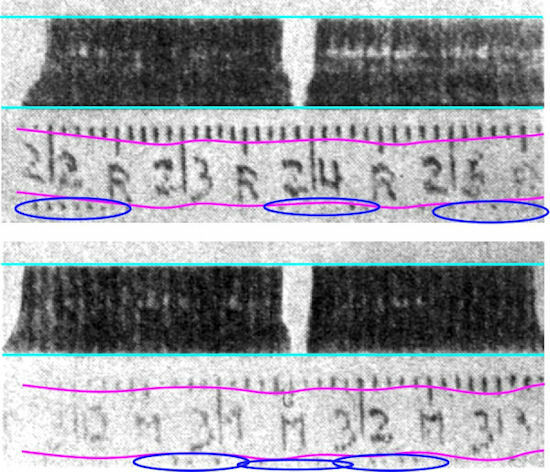 The tape had to be pulled through the Hellschreiber printer (the modified Hell Morse practice recorder mentioned above) by hand. During his visit, Lohmann requested Hell to build a Printator-tape Hellschreiber printer; Hell confirmed receipt of the request the same day in writing. Nothing happened until spring of 1938. 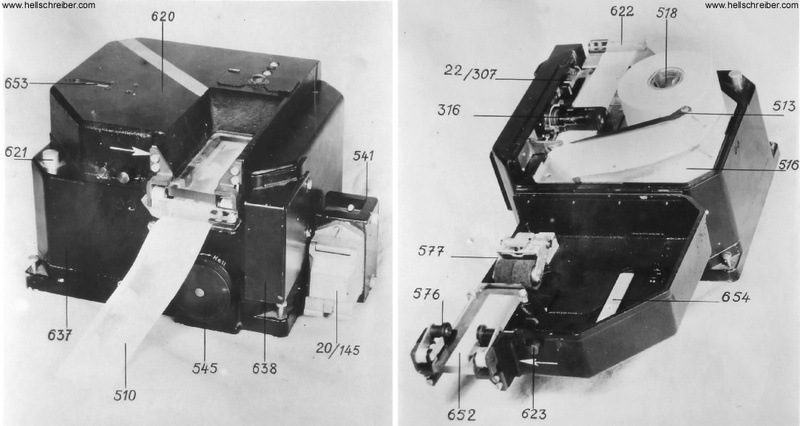 Then, Telefunken made three decisions: 1) The beacon printer is to have 2x2 parallel printer traces, for simultaneous printing of two beacons (triangulation); 2) A beacon identifier letter is to be added to the bearing/azimuth Hellschreiber symbology transmission; 3) Presentation of the printed paper tape to the operator has to be adapted to the conditions on-board the aircraft. The printing method was now finalized, with exception of the decision whether or not to use Printator tape. Due to lack of time and resources, there was no development activity around the Hellschreiber beacon printer at the Hell Co. until the fall of 1938, when they finally build a 2x2 channel paper tape printer. See Fig. 6. System tests were successful, as was a demo flight with the RLM during which triangulation of two beacons was shown. Both Rudolf Hell and Telefunken's aeronautical navigation departments (Luftnavigation, LN 3 and 4) continued to decline testing Lohmann's persistent hobby-horse: Printator tape. Then, at a different Telefunken department, Lohmann had Mr Lehmpull make design drawings for a Hellschreiber "Printator printer" A prototype was built in October of 1938. It was tested during the winter of 1938/39. The printer comprised an infinite loop of Printator tape that was wide enough for two Hellschreiber printer mechanisms. The tape was mounted on a drum that included knife blades for separating the tape layers. Telefunken/Lohmann patented this Printator drum printer in March of 1939 (patent 767513). It claimed the advantage that the erasable tape obviated the need for replacing a used roll of paper tape while in flight. During the spring of 1939, Lohmann demonstrated the Printator drum printer to Rudolf Hell. Hell still declined designing a Printator Hellschreiber printer, due to lack of time/resources and other unspecified considerations. In order to drum up support, Lohmann also demonstrated a Printator tape printer to the RLM. Also during the spring of 1939, the RLM decided to proceed and implement the system. However, they put the program on hold, as the scope of the development program was considered to large for the anticipated short duration of the forthcoming war. Nevertheless, the system (with UHF beacons) was developed up to pre-production maturity by the summer of 1940. This included a new 2x2 channel paper tape Hellschreiber (see Fig. 6). This 2x2 channel printer was the last pre-production model before the similar looking first series-production model, the 2-channel HS 120. They also upgraded the printer amplifier. It now included automatic start/stop of the printer motor based on received signal strength (to save paper tape; ref. Telefunken/Lohmann patent 767527), and generation of Automatic Gain Control for the beacon receiver. During the spring of 1940, the RLM suddenly issued a contract to Telefunken for final development of the rotating beacon system ( = beacon ground station + airborne equipment with printer). Telefunken and its AEG-partner Siemens & Halske (S&H) decided that it was S&H who should develop the Printator drum printer to production readiness, under contract to Telefunken. Note that S&H was the manufacturer of the portable military Hell Feldfernschreiber and the Presse Hell printers for news agencies. Telefunken showed its prototype Printator drum Hellschreiber printer to S&H mid-April of 1940. During the following month, Telefunken and S&H also discussed development of the (rather simple) 2-tone filter unit by S&H. 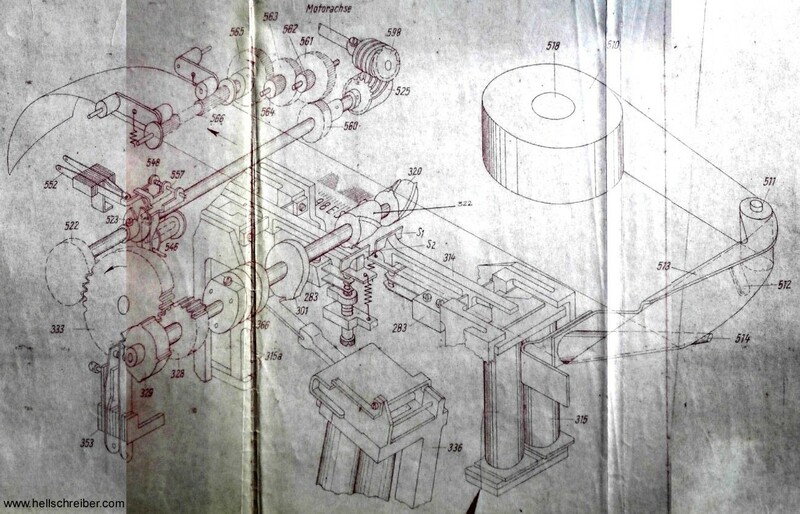 Mid-May 1940, Telefunken shows design drawings of a new Printator printer embodiment to S&H. Instead of the infinite loop of Printator tape in the drum printer, the print medium is now a Printator foil disk. 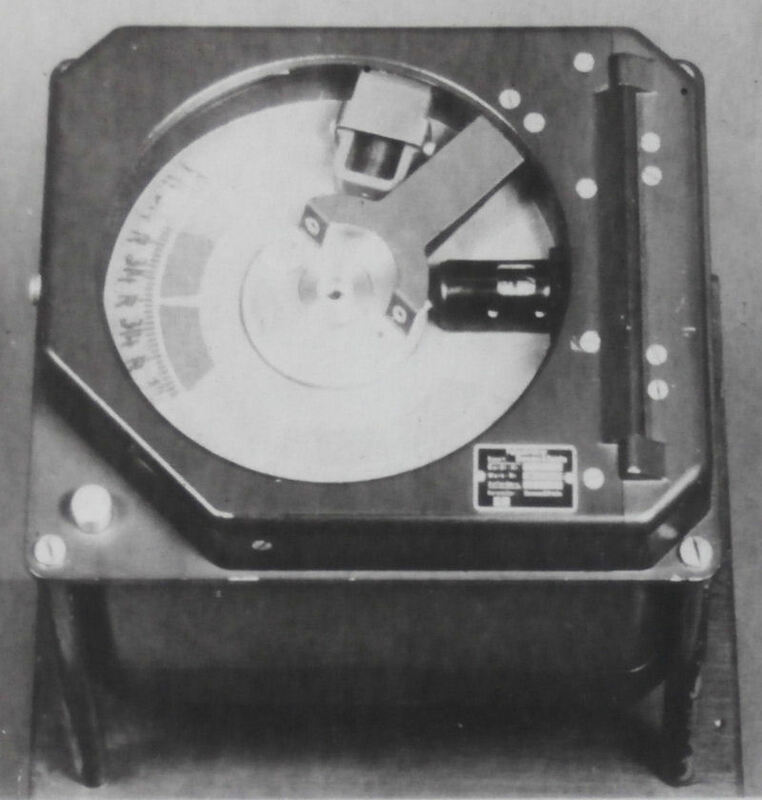 The drum approach had to be abandoned due to two serious problems, as explained in the October 1940 Telefunken/Lohmann patent for the disk printer (patent 767536): 1) unavoidable imperfections in the drum surface (bumps, seams, out-of-round tolerances) cause tape ruptures, and, therefore, 2) spare "drum + tape" modules would have to be carried in the aircraft. As a rather interesting side note, the RLM informed Telefunken early October 1940 that the disk printer and associated printer amplifier unit were to be developed with special RLM priority, as an improved cockpit instrument that was needed for testing with the "Knickebein" beam system (ref. 204A, 204F)! By that time, the British had deployed over a dozen high-power jamming transmitters as a Knickebein countermeasure. As Knickebein had the British codename "Headache", their codename for the jammers was "Aspirin". The Telefunken-internal codename for the printer-amplifier was "Ulrich" (ref. 181, p. 83). Six months later, in the April-May 1941 time-frame, the RLM ordered 2000 Hellschreiber paper-tape printers directly from the Hell Co. I.e., they were not Printator foil printers, as, most likely, those were not yet deemed mature enough. As the airborne printer equipment set had the designator FuG 120 (codename "Bernhardine"), this Hellschreiber received the designator HS 120, see Fig. 7 below. The HS 120 was first used during system tests at the "Bernhard" beacon Be-0 near Berlin in September of 1941. 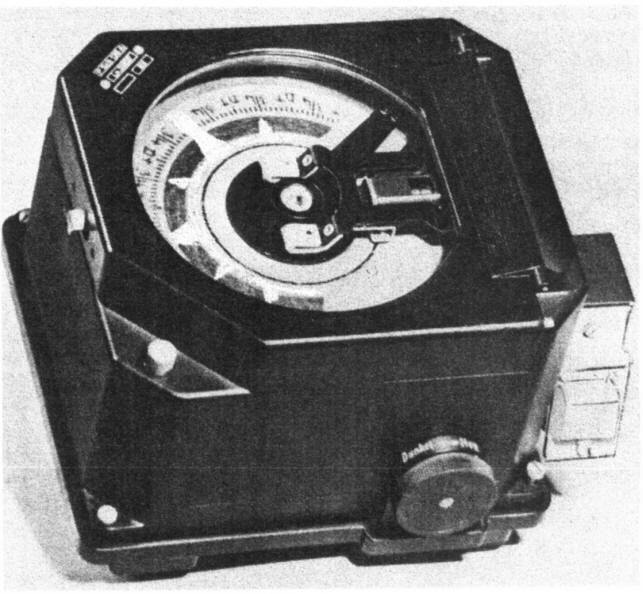 It is a reel-to-reel recorder, like the models that were used during the pre-production development phase (Fig. 6 above).The RLM ordered the associated 2-channel tone filter unit directly from S&H. Note that during May of 1941, the sales department of Telefunken managed to change the mind of the RLM, and Telefunken became prime contractor to the RLM for the design, development, and series production of the entire "Bernhard/Bernhardine" program. Originally, the RLM had awarded the design and development contract for the printer to the Hell Co., and for the audio filter to S&H. During June of 1941, Telefunken provided a 2-channel Hellschreiber printer amplifier to S&H. Several times throughout that month, they also made printer system test equipment available to S&H. Also in June, S&H built a Printator disk printer that met Telefunken and RLM wishes. Subsequently, in August of 1941, S&H received an order from Telefunken for the production of 2400 DFS 120 Printator foil-disk printers. At least the first 2000 of these were to be supplied to the RLM by Telefunken, with S&H as the manufacturer (i.e., as subcontractor to Telefunken). It is unclear if the original RLM order placed at the Hell Co. for 2000 HS 120 printers was maintained, or modified to a smaller quantity. Starting around 1942, the available references (204A-204R) generally refer to the FuG 120 "Bernhardine" printer as Drehfunkschreiber (lit. : rotating beacon printer) DFS 120, in particular in reference to the Printator-foil based Peilschreiber (lit. : direction finding printer) Psch 120. Ref. 204M even double-dips with "Peilschreiber DFS 120". Per ref. 181, the Printator disk-printer was considered "production ready" by October of 1942, at which time the HS 120 was considered "provisional". Ref. 181 also shows a photo (Fig. 61 below) of a mature prototype disk-printer. 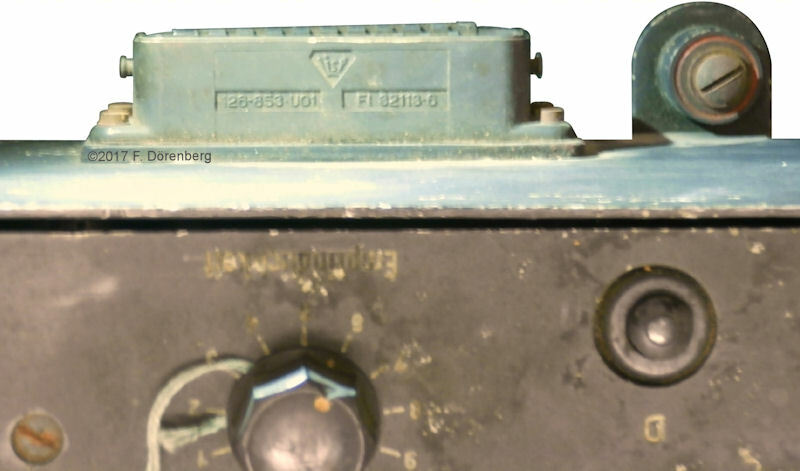 This confirms that at that time, the final Psch 120 design (in particular the housing with control knob and connector on the side - see Fig. 62) was not yet available. Fig. 8 below shows an RLM / Ln outline drawing for the disk-printer that is dated December 1942. However, ref. 183 (from July 1943!) states that the Printator-disk printer was expected to become the standard for practical (operational) use, whereas the HS 120 was (or had become) more suitable for training purposes and testing (incl. transmission monitoring at each Bernhard beacon). This implies that at least until mid-1943, their had been very significant problems with the Printator-disk printer: it was either still not "production ready", had encountered manufacturing issues, or was not suitable for operational use. This is corroborated by the available photos of the FuG 120 system test rack: in October 1942 (ref. 181) and July 1943 (ref. 183), the rack only has an HS 120, but in July 1944 (ref. 203), it has both an HS 120 and a Psch 120a. There are suggestions in 1945 Allied post-war reports that the development and prototyping labs of C. Lorenz A.G. in Falkenstein/Thuringia (some 100 km southeast of Nürnberg) were somehow involved with the Psch 120(a) printer (ref. 54). A number of development labs (some 600-700 employees, no production) were moved there in August of 1943, from Lorenz in Berlin (ref. 55). As discussed above, a distinction is made between the HS 120 Hellschreiber, and the DFS 120 / Psch 120 bearing printers (which, of course, are also Hellschreiber printers). However, there is considerable confusion about the use of the designators Psch 120 versus Psch 120a. Some of the original German WW2 documents use Psch 120 for the compact paper tape bearing printer, and Psch 120a for the bearing printer with an erasable Printator foil-disk. However, other WW2 documents use Psch 120a for the paper tape printer. This is illustrated in the outline drawings of Fig. 8, where both tape and disk printer are designated Psch 120a - with exactly the same Luftnachrichten reference number (Ln 28997) and Gerät Nummer drawing number (124-270A)! Perhaps this unusual confusion is related to the Psch 120 and the Psch 120a being interchangeable regarding electromechanical interfaces, and also because the foil-disk printer at some point in time replaced the paper tape printer, but proved unreliable and impractical, and was shortly thereafter retrofitted back to the paper tape printer (ref. 2). Fig. 8: Both paper tape printer and Printator foil-disk printer designated as "Psch 120 a"
Fig. 9: HS 120 printer and Printator foil-disk printer - here designated as "Psch 120 a"
Ref. 212 from 1944 (p. 348) shows the outline drawing of Printator foil-disk printer marked P.Sch. 120A, see Fig. 8 above. Ref. 198A (1944) states that the FuG 120 "Bernhardine" system included the HS 120 printer, whereas the FuG 120a included the Psch 120a printer. It also states that paper tape came out of the latter printer: "...papierstreifen verlässt den Peilschreiber lose..." This implies that the referenced Psch 120a was a paper tape printer. Ref. 203 (p. 4 of 10, 1944) shows a photo of a PGst 120 test rack with a foil-disk printer that is labeled Psch 120a, see Fig. 9 above. Ref. 44 lists the Psch 120A (Ln 28997, Gerätnr. 124-270 A) and matching bearing printer paper tape container ("Papierbehälter für Peilschreiber", Ln 28999, Gerätnr. 24-273A), which suggests that the Psch 120A uses paper tape. A similar confusion exists regarding the version(s) of the FuG 120 that corresponded to the Psch 120 and Psch 120a. The FuG 120 - without version suffix - was the first generation, and included the HS 120 printer. Intuitively, it would be logical that the next version of the FuG 120 would be the FuG 120a, and included the Psch 120. Likewise, FuG 120b, would have succeeded FuG 120a, and included the Psch 120a. This is also claimed in ref. 2 and 3. However, available WW2 documents (e.g., ref. 198A & 198B) only mention FuG 120a with a Psch 120a... There appears to be no confusion about the FuG 120k including the small ("klein") simplified Psch 120k (which actually never entered operational service). In the remainder of this treatise, Psch 120 is used exclusively for the compact paper tape bearing printer, and Psch 120a for the bearing printer with an erasable Printator foil-disk. Caveat emptor! 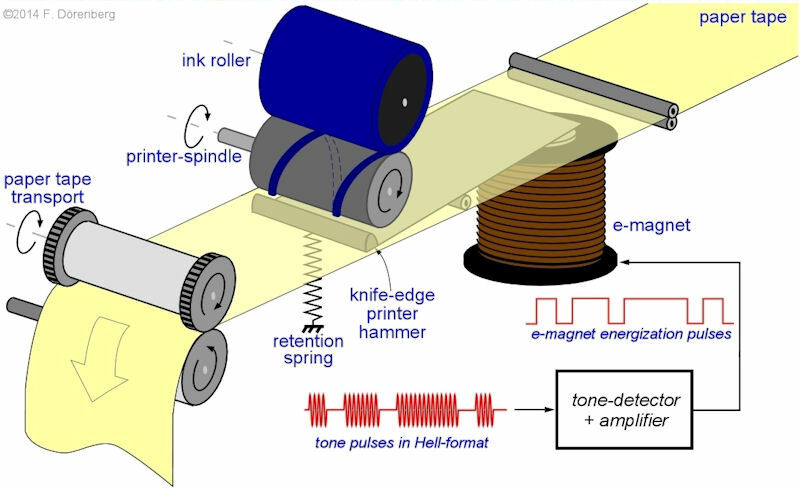 A standard Hellschreiber printer consists of an inked spindle that is placed across, and slightly above, a moving paper tape. Below the paper tape is an electromagnet with a hammer. See Figure 10. When the magnet is energized, the hammer pushes the paper tape against the continuously turning spindle. The magnet-solenoid is energized as soon as, and as long as, a tone signal is received. This causes a dot or line segment to be printed across the paper tape. The length of the printed line depends on the amount of time that the electromagnet is energized. Unlike very complex (and large) "telex" teleprinters, this very robust method requires only detection of "signal present / not present". It requires no machine-interpretation of a sequence of "bits", to determine what to print. Also, the compact Hell-printer mechanism has very few moving parts, and is not limited to printing a predetermined character-set. The Hellschreiber can be thought of as a remote dot-matrix printer for any form of low-resolution graphical information (a line of text or other symbols). See the Hellschreiber "How it works" page. The "Bernhardine" system is actually a dual Hellschreiber-printer. It has two independent printer mechanisms. The lower trace prints the compass rose (azimuth) or command text-messages. This is transmitted in Hellschreiber-format by the single-beam antenna array of the rotating "Bernhard" ground station. The upper trace prints the strength of the continuous tone transmitted by the twin-beam antenna array of the ground-station. The two printer-spindles are mounted on the same motorized shaft that turns at 720 rpm (12 rps, ref. 15). The "Bernhard" beacon rotates twice per minute. So it has a rotational speed of 360° / 30 = 12° per second, or 1° in 1/12 sec. The azimuth data is printed with a resolution of three pixel-columns per degree (see Figure 12). That is: 3 x 12 = 36 columns per second. The bar-graph is printed with six pixel-columns per degree (ref. 15). That is: 6 x 12 = 72 columns per second. Of course it is possible to print 36 pixel columns per second with a spindle that has a single thread that is wrapped once around the hub of the spindle. Such a spindle would have to turn at 36 rps = 2160 rpm. Likewise, such a spindle can print 72 bar-graph columns per second, by spinning at 72 rps = 4320 rpm. This is not practical for two reasons. First, 4320 rpm is extremely fast. Secondly, in the "Bernhardine" printer, both spindles are mounted on the same shaft, so they turn at the same speed. The solution is simple: use multi-start spindles. By using a spindle with N starts ( = separate threads), the required shaft speed is reduced by a factor N. Two spindles on the same shaft can have a different number of starts. In the "Bernhardine", the bar-graph printer has a 6-start spindle (N = 6): it has six thread-segments. Each covers 360° / 6 = 60° of the circumference of the spindle hub. The thread segments do not overlap. See Figure 13 and 14. 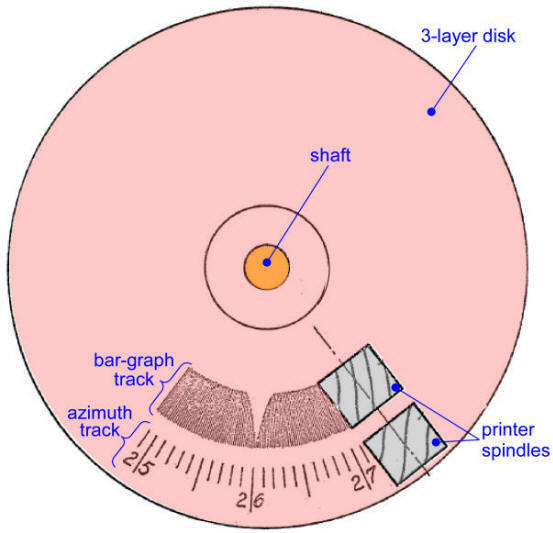 The azimuth printer has a 3-start spindle: N = 3. Its three thread-segments each cover 360° / 3 = 120° of the spindle hub. Again, the thread segments do not overlap. This means that these two spindles can turn at the same speed: 2160 / 3 = 4320 / 6 = 720 rpm. This speed is easily obtained with down-gearing a standard 3000 - 4000 rpm motor. E.g., the "Presse Hell" printer has a 3000 rpm motor, the "Feld-Hell" machine has a 3600 rpm motor. The 3-start spindle prints three columns per revolution, the 6-start spindle prints twice as many. The columns of the bar-graph must be printed bottom-to-top. In principle, the azimuth data could be printed either bottom-to-top or top-to-bottom. However, as explained below, it has to be printed top-to-bottom, because the printer is synchronized to the degree tick-marks at the top of the printout ( = every third column = 1 revolution of the spindle). This means that the two spindles have to print columns in opposite direction, even though they turn in the same direction! This is solved by one spindle having a right-hand thread, and the other spindle a left-hand thread. See Figure 13 and 14 above. As described above, the "Bernhard" beacon transmits a constant tone via its twin-lobe antenna array. The signal strength of the received signal is printed as a bar-graph in the upper printer trace. See Figures 3, 15, and 16. The bar-graph has six bars per degree of azimuth (ref. 15, 181). Special circuitry is used, to ensure that the bars start exactly at the bottom of each printed pixel column, and that the height ( = duration of the energization of the printer magnet) corresponds to the signal strength (0 - 100%). Conversion of the amplitude of the received 1800 Hz tone signal to a DC-voltage. The signal amplitude is determined by a conventional tone detector that is found in all standard Hellschreiber printer-amplifiers. It consists of a pre-amplifier, followed by a full-wave diode rectifier and a simple smoothing filter. This converts the momentary amplitude to an equivalent DC voltage level. Conversion of this DC-voltage to the width of the energization pulse. Each printed signal-strength bar must start at the bottom of the printed track. This means that the start of the energization pulses must be synchronized to the position of the continuously turning printer-spindle. The synchronized pulse-width conversion is done by the clever circuitry shown in Figure 17. The concept of this Pulse Width Modulation conversion was conceived by Rudolf Hell, and patented by him in October of 1937 (patent 730625). The actual Pulse Width Modulator circuitry was located in the SV 120 printer amplifier. The drive-shaft of the printer-spindle (item 11 in the schematic above) has a notch (item 17). It actuates a switch (item 18) once per revolution of the spindle, when the thread of the spindle passes through its start position ( = bottom of the printed vertical line). Closure of the switch causes a capacitor (item 23) to be step-charged with a fixed supply voltage (item 24). As soon as the switch re-opens, the capacitor begins to discharge across a resistor (21). The value of the capacitor and its bleed resistor are chosen such that the discharge time is equal to (or slightly larger than) the duration of a single spindle revolution. This creates a sawtooth voltage, with a fixed amplitude and period. Clearly, the capacitor voltage is not linear but an exponential curve. The simplified schematic above does not show components that linearize this curve. Note that in the actual SV 120, the capacitor discharges via an inductance (choke coil), rather than a resistor. The DC-amplitude EM of the received constant tone signal is applied across resistor (22). This superimposes EM onto the capacitor voltage. This sum voltage is then offset with a fixed negative grid-bias voltage (20). The latter voltage is chosen such that if the input signal is zero ( = no beacon signal received), the anode current of the tube (valve, 19) is too small to energize the printer-solenoid. 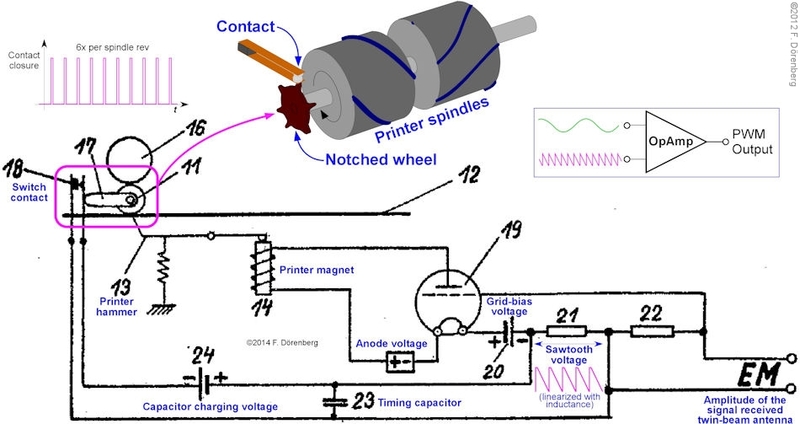 As soon as an input signal is present, the gain of the tube causes the anode current to exceed the energization level of the printer solenoid, and the spindle begins to print a line across the paper tape (bottom to top). For a small EM, the resulting energization pulse is short, and a short signal-strength bar is printed. For a large EM, a long signal-strength bar is printed. In modern times, Hell's analog technique is referred to as "intersective pulse-width modulation". 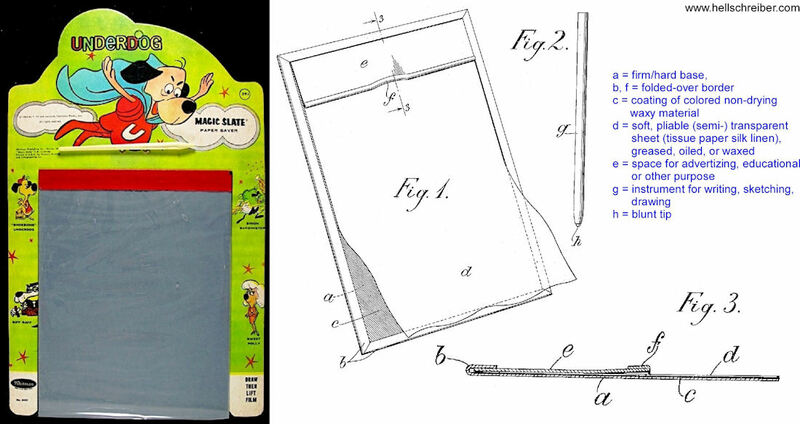 It was re-patented in the USA in the 1960s, with follow-on patents even after the turn of the century! Note that the above circuitry is for a printer spindle that has a single thread that is wrapped once around the hub of the spindle. However, the actual hub of the "Bernhardine" bar-graph has six partial threads (each covering 60° of the hub's circumference). This means that the spindle prints six consecutive columns per revolution of the spindle. To make this work, this printer has six notches on the spindle shaft, instead of just one. The pulse-width conversion circuitry is exactly the same, with the exception of the time-constant for discharging the timing capacitor. The notched disk and associated contact ("Nockenkontaktsatz") was made by the Hell company (p. 33 in ref. 15). The single-lobe antenna of the "Bernhard" ground-station continuously transmits the momentary direction of the antenna (i.e., antenna azimuth = bearing from the station) in Hellschreiber-format. This is printed by the second "Bernhardine" Hellschreiber-printer channel, directly below the bar graph of the signal-strength. As the beacon rotates at 12°/sec, the beacon signals are only received for a couple of seconds during each rotation. The result is a printed segment of the compass rose that is about 30-40 degree wide. The V-shaped dip in the bar graph points at the actual bearing-from-the-beacon that the aircraft is on (255.0° in Figure 21). 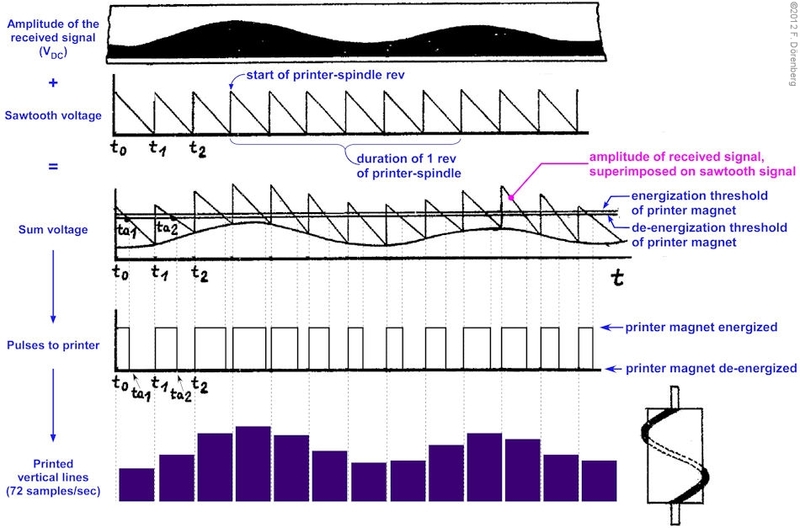 Even if sender and printer are running at exactly the same speed, phase differences result in the printed track being shifted up or down. The slant, or shift, causes part of the track to end up beyond the vertical limit (upper or lower) of the track. See Figure 23. In standard Hellschreiber printers of the 1930s and 1940s, the classical solution to this problem is to use a printer spindle with a thread that is wound twice around the hub of the spindle (or, equivalently, a two-start spindle with two intertwined 1-turn threads). Such a spindle prints two identical text lines in parallel, one above the other. Hence, at least one text line is always fully legible. See Figure 24. This is combined with manual adjustment of the printer's motor speed. This solution is not an option for the "Bernhardine" printer! Yes, doubling the printout of the azimuth data would make the compass data legible at all time. However, due to the slant or vertical shift of the printed azimuth data, the bar-graph pointer would no longer line up with the degree tick-marks. See Figure 26. Furthermore, manual speed adjustment would not have been practical for the "Bernhardine", as the rotating beacon is only received about 3-5 sec per 30 sec rotation, and (night) fighter pilots cannot afford to spend significant time on such a task. The azimuth printer must somehow be synchronized to the pixel stream, such that the degree tick-marks are aligned with the top of the printed track. I.e., they must always be printed just below, and parallel to the bar-graph. Fig. 26: The standard Hellschreiber "double helix" is not an option for the "Bernhardine"
Unlike "telex" teleprinters and post-war start-stop Hellschreibers, the Hellschreiber "font" of the azimuth data contains no explicit start "bits". However, the pixel stream does include a tick-mark at the top of every third pixel column. Each tick-mark is at least three pixels long (the 5° tick-marks are 4½ pixels long, and the 10° tick-marks 10 pixels). These tick-marks are used for synchronization! As in all teleprinters with character synchronization, the "Bernhardine" printer motor runs a little faster than the nominal speed: 1-2% (p. 91 in ref. 181, 1.5% per ref. 15 and p. 18 in ref. 183). The 1-2% is equivalent to about ½ pixel per three pixel-columns that make up each 1 degree compass interval: 1-2% x 3 columns x 12 pixels/column = 0.36 - 0.72 pixels. This way, it finishes printing each set of three pixel columns slightly early: nominal pixel duration is 30 sec/revolution / (360° x 3 columns/° x 12 pixels/column) = 2.31 msec. Note that p. 91 in ref. 181 incorrectly states "ca. 30 msec", which is actually the 27.78 msec nominal duration of one pixel column. The printer then waits a brief moment until the next sync pulse (here: a tick-mark) is detected, and then starts to print the next character at exactly the right moment. The same method has been used since the mid-1950s, to synchronize clocks at train stations to an accurate central master clock: each minute, all station clocks run several seconds fast (1.5 sec nominally). At the top of the minute, the hands of the clock are held in place, until the central clock sends a release-signal to all slave clocks, to start ticking away the next minute at exactly the right moment. Tolerances in the rotational speed of the "Bernhard" beacon: it was regulated to within ±0.2-0.3 % of exactly 2 rpm (p. 80 in ref. 181, p. 8 & 18 in ref. 183). The beacon should not turn slower than the allowed tolerance. If so, a black pixel at the bottom of the column preceding the next tick-mark (e.g., the last pixel of the beacon identifier letter), could inadvertently be interpreted as the next tick-mark and release the spindle. This may cause slant of the printed symbology to continue or even worsen, until the printer temporarily syncs again to a real tick-mark. Note that at least two out of every five degree tick-marks are preceded by least one complete white pixel column. This is enough for a "clean" sync. Tolerances in the printer motor speed: it was regulated to within ±0.5 % with a centrifugal regulator. The reaction speed of the spring-loaded "catch and release" synchronization electro-magnet. The 2600 Hz tone used for the Hellschreiber pulses has a cycle time of 1000 / 2600 ≈ 0.38 msec. The pulse-detection circuitry that drives the electro-magnet always loses part of one tone-cycle, both at the start and at the end of each pulse. As stated above, the spindle of the bar-graph printer and the spindle of the azimuth printer are both mounted on the same spinning shaft. But only the azimuth spindle requires synchronization. This implies that this spindle cannot be permanently fixed to the spindle shaft! It is actually mounted onto that shaft with a small standard slip-clutch. This allows the spindle to be "grabbed" and stopped, while the spindle shaft keeps turning at a constant speed. As soon as the spindle is released, it starts to spin again with the shaft. So a "grab, hold, and release" mechanism is needed. This is just a simple so-called "indexing" mechanism. There is a "catch" notch or pin on the spindle hub (not on the spindle shaft!). A small hook at the end of a spring-loaded lever holds the notch, and prevents the spindle from turning with the spindle shaft. When the motor is running, the clutch slips continuously. A brief energization of the synchronization electro-magnet causes the notch to be released. The spindle now turns with the shaft (no slip). After one revolution of the spindle, the notch on the spindle is caught again by the lever. The spindle is briefly stopped until the next release-pulse (= degree tick-mark), etc. The synchronization-magnet is placed in series with the magnet-solenoid of the azimuth printer. That is, they are energized and de-energized simultaneously. Let's go through a complete "catch-and-release"" sequence, see Figure 27. Assume that the spindle is held by the sync-lever. The first pixel of a degree tick-mark is received. This causes the notch of the spindle to be released. The spindle turns freely for 1 revolution = three pixel columns. Note that, depending on the pixel pattern in these three columns, the sync-magnet may arm and disarm the lever several times during this revolution! However, this has no effect, since the notch on the spindle is only near the hook of the lever just before the spindle completes its revolution. The lever catches the notch during the white pixel that always precedes the next degree tick-mark ( = bottom of the preceding pixel column). This concept of synchronization is based on characteristics of the Hellschreiber pixel-stream instead of explicit start-bits. This was was re-used in the Hell Blattschreiber of the 1950s. In the standard Hell-system, the character font has two white pixels, both above and below each printed pixel column. I.e., there is symmetry in each pixel column, and there should be no black pixels at the top and bottom of the printed pixel columns. During printing, the actual vertical symmetry can be measured, and used to speed up or slow down the motor. This control-loop eliminates the phase difference and, hence, also the speed difference. Hellschreibers developed after this Blattschreiber, all used start-stop synchronization with an explicit starts-pulse embedded into the first (normally blank) column of the character font: Hell-39/44, Hell 72/73, and Hell-80. The Hell-40 was a replacement for the "Presse Hell", so it did not use synchronization. According to the "Bernhardine" manual (ref. 15), it required 2 to 4 beam-passages for the synchronization system to be tracking the tick-marks properly: "After selecting the beacon, wait until the Hellschreiber spools up and prints properly (1-2 minutes). The first two prints are not dependable". This could explain the wavy printout in Figure 18 (pink lines). The printed bar-graph is perfectly straight, as it is always fully synchronized to the spindle. Note that waviness could also have been caused by variations in the speed of the beacon. As stated above, the AGC and synchronization circuitry of the SV120 printer amplifier provides automatic adjustment of the two printer tracks. The only manual adjustment available, is the gain control of the pre-amplifier of the SV 120. The knob labeled "Empfindlichkeit" ( = sensitivity) is on the front of the HS 120 printer. Figure 29 shows how it had to be used to obtain correct printing quality. A few "Bernhard" stations had the capability to transmit 10-character "Reportage" messages, instead of the the azimuth data. Clearly, these messages should also be printed as a single horizontal line of text. I.e., without slant or vertical shift. The normal Hellschreiber font does not include a tick-mark at the top of every third pixel column. The character generator that was used for sending the "reportage" text strings added a degree tick-mark at the top of every single pixel-column, instead of every third column (p. 4 ( = Blatt 3) of ref. 198A). "BERNHARDINE" PRINTER MODEL "HS 120"
"dim/bright" toggle switch for the brightness of the lighting for the print-out. The same basic design applies to the Psch120, and DFS120/Psch120a. I have documented three HS 120 Hellschreiber machines: one in the collection of the Imperial War Museums in the UK (Werk-Nr. 70206), and two in private collections (one with Werk-Nr. 70346, the other one without equipment label). The HS 120 unit measures 35.7x15x14 cm without the housing (WxHxD, ≈14x6x5½"). This is actually quite compact, and not the unrealistic 60x30x20 cm (≈23½x12x8") that is often quoted for this model (ref. 6, 49). The official manual (ref. 15) and ref. 212 state the following dimensions: 36.2x21x17.4 cm (WxHxD, ≈14.3x8.3x7"). However, the latter height includes a large connector that protrudes from the bottom of the unit, and mounting lugs at the top and bottom on the back of the housing (see Figure 13 in ref. 15 and Fig. 33 below). The unit weighs 7 kg (15½ lbs). Based on its size and the fact that it required attention, it was only used in larger aircraft (two or more seats, e.g., near the radio/radar operator), and in the stationary equipment room of every "Bernhard" beacon. The window in front of the paper tape measures about 24x4 cm. The paper tape has about three times the width of standard Hellschreiber tape (15 mm). The tape moves from right to left in the window. The paper tape is re-wound onto a second reel inside the printer, so there is no paper tape mess in the cockpit. The upper part of the front panel is hinged, to facilitate inserting the paper tape across the front of the printer (see Fig. 40 below). The front panel has controls for printer-amplifier gain ("Empfindlichkeit" = sensitivity) and lighting brightness ("dunkel/hell" = dim/bright). 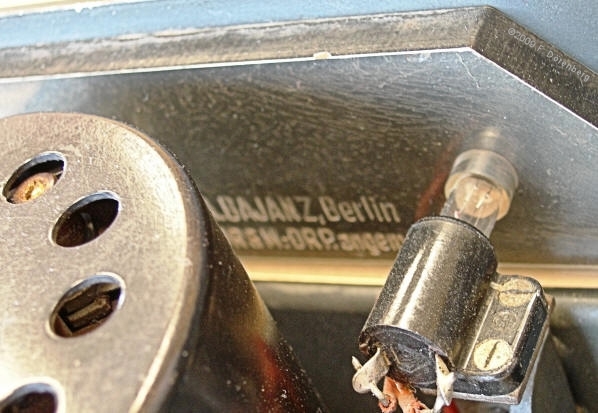 The push button ("Drucktaste") marked "D" is connected to the SV120 printer-amplifier. It is used for resetting the automatic gain control signal to the EBl 3 radio receiver. At the left and right bottom corner, there is a large mounting bolt that goes all the way through the unit, into the equipment rack of the aircraft. The red ring around the hole for the bolts indicates that the bolts may be removed for field maintenance by standard technicians. The bolts are spring-loaded, to expedite removal and installation of the unit. The connector carries the markings "126-853-U01" and "Fl 32113-6" (ref. 170), as well as the triangular "List" logo. It was made by the company "Elektro-Mechanik Heinrich List" in Berlin-Teltow. One of the production sites of the Hell company was located in the same industrial park. The List company had two military identifiers ("Fertigungskennzeichen") for its Berlin facilities: "hbu" and "ocw". After WW2, the Teltow area became part of the Soviet Occupation Zone. In 1945/46, the confiscated Hell and List companies in Teltow were combined into the "Elektro-Feinbau GmbH", and by 1948 absorbed into the people-owned "VEB Mechanik-Askania Teltow" company, to be renamed "VEB Geräte- und Regler Werke Teltow" in the early 1950s. Ref. 171. "Gerät-Nummer" 124-1425A-1 refers to a "Spezial Hellschreiber". All items of the FuG 120 "Bernhardine" system have a Gerät-Nummer starting with "124". This two-part Luftwaffe numbering system is similar to the one used by the Heer (Army), ref. 50: a category number ("Stoffgliederungsgruppe", possibly with a suffix for an "Untergruppe" sub-category), followed by an item number. "Werk-Nr." is a production number. Obviously, no 70206 units were ever built. The "7" may refer to the production series or batch, model variant, modification standard, or factory. The "0206" would then be the actual serial number of this particular unit. "Anforderzeichen" Ln 28990 (p. 28 in ref. 44). The "Ln" number refers to a Kennblatt (specification sheet) of the Luftwaffe Luftnachrichten (Signal Corps), ref. 52. The major items of the FuG 120 span the Ln-number range 28980-28990 (see pp. 7, 8, 26 in ref. 15). This particular Ln-number belonged to the technical domain of LU-F-NAVKOMMÜB: Aeronautical Radio Navigation, Communication, Surveillance. These days, the combination Com-Nav-Surveillance ("CNS") is still used in aviation! The HS120 was built by the Hell company, starting in 1942 (p. 188 in ref. 44). HS 120, the equipment designator. "cmw" - this is the 3-letter military manufacturer code ("Fertigungskennzeichen") of the Hell company. Waffenamt acceptance stamp "BAL 599" inside a circle. According to Luftwaffe service regulations, "BAL" stands for Bauaufsichten des Reichsluftfahrtministerium (the Administration of the RLM for the Supervision of Construction, ref. 52, 53), in short "Bauaufsicht Luft". It was subordinate to the Technisches Amt of the RLM. The number "599" refers to an accredited inspector. BAL 378 number has also appeared on products of Fernmeldetechnisches Entwicklungslaboratorium Dr. Ing. H. Kimmel ("Development lab for telecom equipment") in Munich, later Münchener Apparatebau für Elektronische Geräte Kimmel GmbH & Co. KG. Their 3-letter military manufacturer's code was "bes". 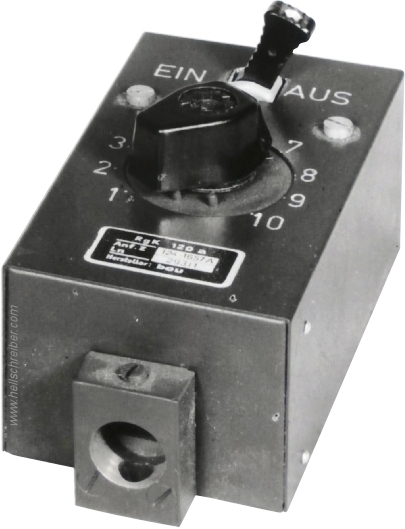 Kimmel also made the "NF Phasenuhr" (audio frequency phase-indicator, with 360º scale) that was part of the on-board equipment of the 1943 Lorenz VHF rotating-phase navigation system "Erich" (very similar to the VOR system developed in parallel in the USA). Like "Bernhard/Bernhardine", the "Erich" system also used the EBl 3 radio receiver. Printer solenoids ("Leitstrahlmagnet" and "Kennzeichenmagnet"): 4500 turns of 0.1 mm CuL ("Kupferlackdraht" = enameled copper wire, a.k.a. magnet wire), DC-resistance of 480 ohms. Synchronization solenoid ("Synchronisiermagnet"): 5500 turns of 0.1 mm CuL, DC-resistance of 510 ohms. To avoid a paper tape mess in the cockpit, the paper tape is unwound from one spool, and wound onto a second spool (like in a reel-to-reel tape recorder). To minimize paper consumption (and the hassle of having to replace rolls of paper tape in flight), the paper transport motor was only enabled when the strength of the received signals exceeded a certain minimum value. I.e., a "squelch" function. This way, the paper moved during less than 10 sec per minute (3-5 sec per beacon revolution, equivalent to 36-60 deg change in antenna azimuth). After passage of the beacon's beam, the paper tape would stop moving, and the operator could interpret the print-out. The HS120 is powered by a 24 Volt DC motor, running at 3000 rpm. It was a model SMK0, made by the "Stark-Motor" company of Berlin. Before the war, Stark made electric motors and alternators for the automotive industry. Stark motors were also used in Luftwaffe aircraft, including servo-motors for bombsights. 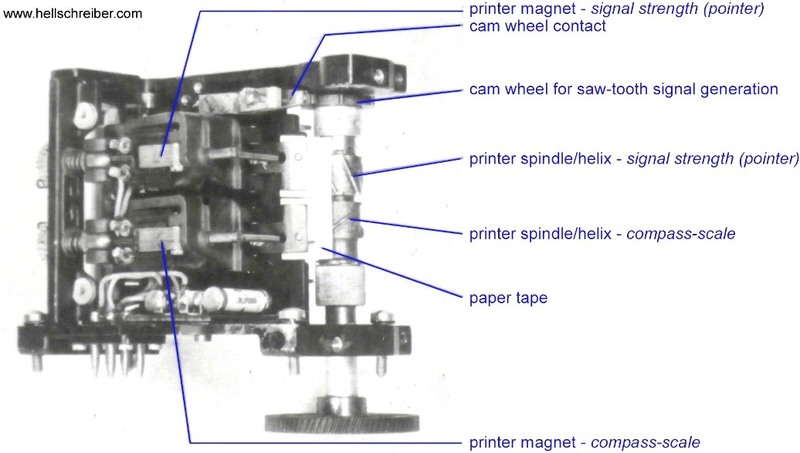 (with advert for "small rpm-controlled electric machines"
The bottom of the HS 120 shows how the single motor drives the shaft of the printer spindles and the paper tape transport (Figure 50). All capacitors and inductors are also located here. 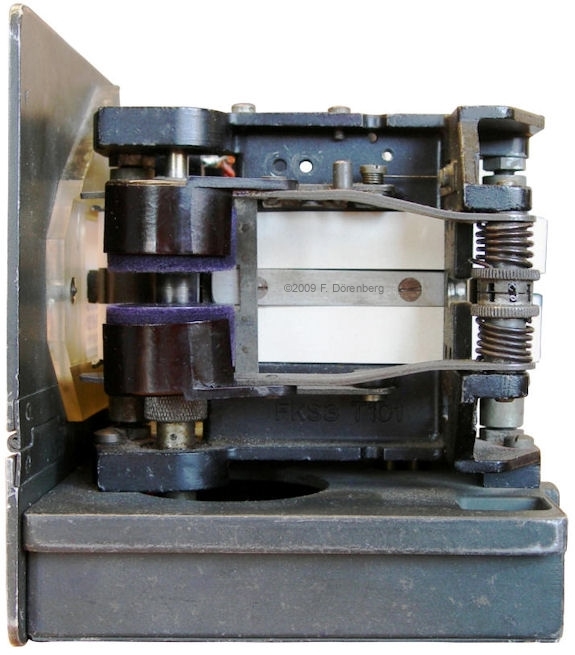 The spool for the printed paper tape is driven via a spring belt that can slip (top right in Figure 50); this tensioning mechanism is needed, as the speed of the spool depends on how much paper tape is wound onto it. The following marking is engraved on the back side of the plastic backlighting panel of the HS120: "A. BAJANZ, Berlin -- DRGM;DRP.angem." The Bajanz company manufactured acrylic glass parts (common trade names are plexiglas and perspex), including canopies for military planes (e.g., Heinkel). The abbreviations DRGM, DRP, and angem. respectively stand for "Deutsches Reichsgebrauchsmuster" (model - or patent, in the proper sense of the latter word), "Deutsches Reichspatentamt" (the patent office), and angemeldet: "applied for" ("pending"). This implies "registration without patent protection". "BERNHARDINE" PRINTER MODEL "Psch 120"
The paper-tape Psch 120 "Peilschreiber" (bearing printer) was built by Siemens & Halske A.-G in Berlin (p. 188 in ref. 44, ref. 212). Their military manufacturer code was "eas". This code was used for all Siemens plants, such as the Wernerwerk telecom design and manufacturing plant in Berlin-Siemensstadt, were other Hellschreibers were built. Siemens also made the RDFS 120 "Rahmen für Drehfunkschreiber" (the mounting frame for Psch 120), and a "Papierbehalter für Peilschreiber" for storing (used) paper tape of the Psch 120. Size of the Psch 120 is 18x12.2x15.3 cm (WxHxD, ≈7x5x6"), about half that of HS 120, as is the weight (3.8 kg). Psch 120 has no spool for winding up printed tape; printed tape exits the printer; a sharp edge is provided to tear off the tape. Psch 120 does not have a "Hell-Dunkel" bright-dim toggle switch, but a potentiometer for continuous variation of the lighting. 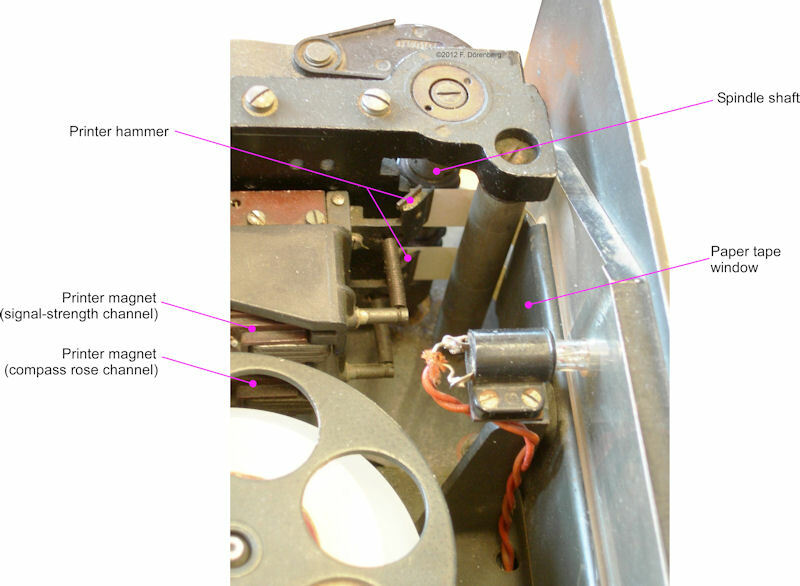 The "D" button of the Psch 120 not only resets the AGC voltage to the EBl 3 receiver, but also turns on the motor to advance the paper tape (e.g., to exit a section of printed tape that is visible in the viewing window and pass it on to another crew member). 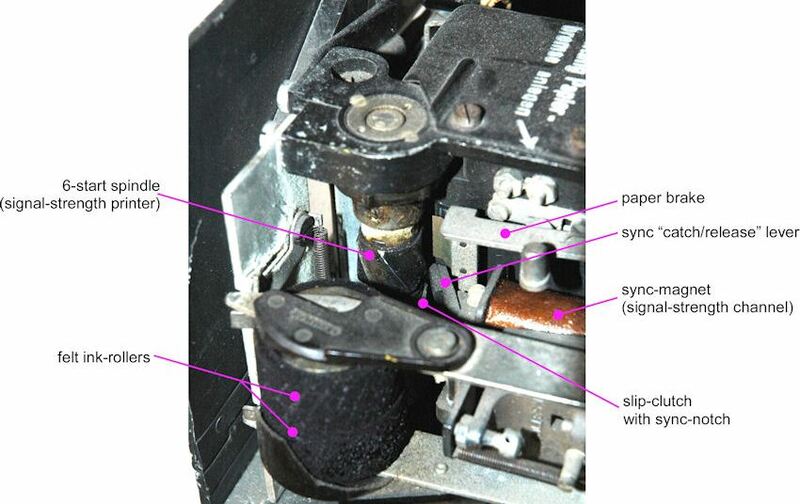 The automatic start/stop function of the motor now has a delayed "off", such that the printed section of the tape automatically leaves the machine. The pointer spindle no longer has 6 but only 4 starts (threads). I.e., it only prints 4 pixel-columns per revolution of the spindle. The cam wheel involved with generating the required sawtooth signal also only has 4 notches instead of six (one per spindle-start). This causes the amplitude of the generated sawtooth signal to be reduced. To compensate, the associated Pulse Width Modulation circuitry in the Schreibverstärker SV 120 printer-amplifier was modified to increase gain. The compass scale Hell-printer still has 3 starts, but the synchronization catch has been moved away from immediately next to the spindle. In the HS 120, the spindle for printing the compass scale (or command message) can spin freely on the printer spindle shaft, and is held by a slip clutch. The Psch 120 drawing (Fig. 56 below) suggests that entire spindle shaft (i.e., both spindles) downstream of the slip clutch (item nr. 366) are held & released by the synch mechanism (notched disk, item nr. 302, and synchronization e-magnet, item nr. 336). The "Empfindlichkeit" sensitivity gain control of the HS 120 has been moved to a small external control box, the Reglerkasten RgK 120a (Fig. 55). The electro-magnets of the Psch 120 printer require a nominal DC current of 32 mA, compared to 40 mA in the HS 120 printer. Therefore, the RgK 120a control box also contains current-limiting resistors. Furthermore, the RgK 120a has a toggle switch, to turn the power control relay of the Umformer U 120 power supply on/off. Like the HS 120, the 24 volt DC motor has a centrifugal speed regulator. However, the associated electrical contact is now stationary. The printer has a die-cast housing ("Spritzguß") instead of sheet metal. The HS 120 does not have a mounting frame with shock mounts, but just four shock mounts. The associated mounting frame is RPsch 120a, with 3 captive screws. System accuracy: +/- 0.5 deg, as with the HS 120. The paper tape of the HS 120 is over 4 cm wide. The paper tape of the Psch 120 is only about 28 mm wide (based on its relative size in the outline drawing of ref. 199). Note that the above differences with respect to the HS 120 also apply to the Printator foil-disk printer Psch 120a. The unit measured 18x18.5x12.2 cm (WxDxH, ≈7x7.3x5 inch; excluding the protruding connector block) and weighed 3.8 kg (8.4 lbs); ref. 199). A roll of paper lasted 8 printing hours. "BERNHARDINE" PRINTER MODEL "DFS 120" / "Psch 120A"
Peilschreiber Psch 120a is the printer of "Berhardine" FuG 120b system. It is a "paperless" printer. The idea was to avoid time-consuming replacement of a full roll of tape during flight, and avoid running out of tape altogether. The 1939 Telefunken/Lohmann patent 767513 proposes a bearing printer that uses an endless 3-layer printing tape. This tape is a triple-layer sandwich of wax-covered dark paper, thin silk tape, and thin protective celluloid tape. The tape was referred to as "Printator" tape. In 1928, Hugo Hahn, owner of the Printator G.m.b.H. company in Berlin-Weißensee (Lehderstraße 20-21), patented a 3-layer writing pad with a built-in layer-separation mechanism (US patent nr. 1,891,414 "Writing and drawing pad"). Hahn also held several patents related to stamping, and also one from 1925 for boots with built-in support soles for people with flat feet ("Plattfußstiefel"). 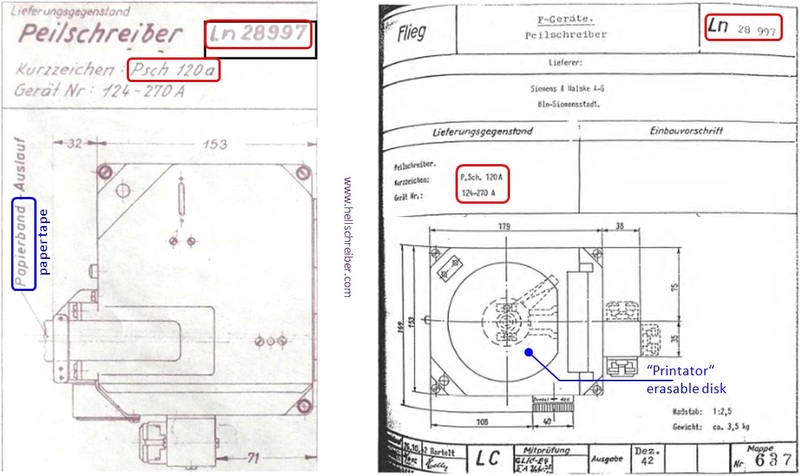 In the Telefunken/Lohmann patent 767513, there are two embodiments of a Printator Hellschreiber printer. In the second one, a section of Printator tape is mounted on a cylindrical "drum". The layers are joined just before entering the printer window. Where the printer-spindle applies pressure to the tape, the silk tape sticks to the waxed paper and the pressure points (pixels) become visible. Erasing is done by separating the silk tape from the waxed paper with a knife blade, after passing the printing window. See Figure 58. This is referred to as a "Wachsschreiber" or "Folienschreiber", i.e., a wax or foil (film) printer. In the USA, one can rather easily patent pre-existing devices, methods, plants, etc., so the Bernhardine Wachsschreiber was (re-)patented there in 2003 (US Patent 6,578,615) by the Hewlett-Packard (HP) company. Whereas patent 767513 proposes an endless tape, the 1940 Telefunken/Lohmann patent 767536 proposes a triple-layer erasable disk. See Figure 59. Note that the threads on the two printer spindles are oriented the wrong way (turned 90 deg). The latter patent suggests that the drum-shaped wax printer has some serious disadvantages: 1) unavoidable imperfections in the drum surface (bumps, seams, out-of-round tolerances) cause tape ruptures, and, therefore, 2) spare "drum + tape" modules would have to be carried in the aircraft. Supposedly the erasable disk concept corrected these shortcomings. This is what was actually implemented in the Psch 120a "Bernhardine" printer. See Figure 61 and 62. It has the same shape and size as the Psch 120 paper-tape printer. Clearly, replacing an erasable disk module might not necessarily have been any easier than replacing a drum or installing a new tape. The disk printer proved inadequate in operation: too complicated and unreliable. It was taken out of service, and retrofitted back to the Psch 120 paper-tape printer (p. 96 in ref. 3). 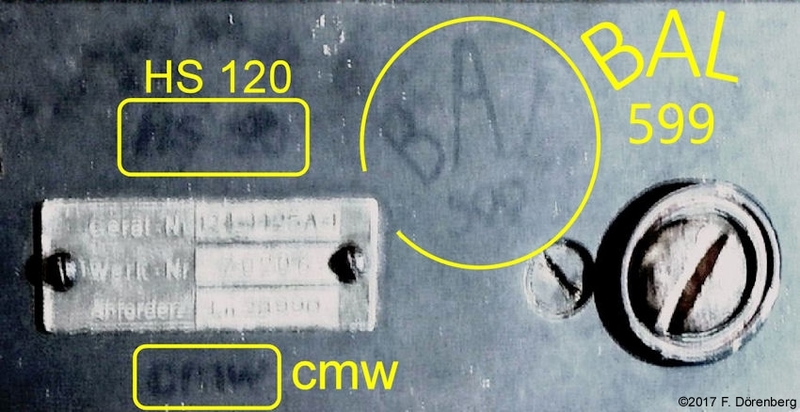 The equipment label on the above Psch 120a reads Siemens & Halske, Peilschreiber, Werk Nr. - Muster 2 (bearing printer, prototype number 2 ). The housing measures 17.9x11.3x15.3cm (WxHxD, 7x4.4x6.4 inch). The unit weighs 3.5 kg (≈7.7 lbs). Ref. 212. In the photo above, the printed compass rose segments cover about 30 degrees of azimuth. The bearing value "34" ( = 340 deg) is repeated 3-4 times during each pass. This means that the signal was not sent by a real ground station, but generated by a PS 120 test signal generator. Also, the station identifier is "D+" or "DT", rather than the standard single letter. The photo also shows that the disk has room for about 5 passages of the beam of the ground station, before the oldest plot is erased. Towards the end of the war, a much simplified Bernhard/Bernhardine system was conceived, and possibly even under development. Its Bernhardine system was the FuG 120k, where "k" stands for "klein", i.e., "small". FuG 120k did not have the two-channel tone filter unit. The printer-amplifier unit also only had one channel. Hence, the actual printer only had a single printer mechanism, printed on narrower paper tape, and had no cam wheel on the spindle shaft as part of the synchronization circuitry. This made the entire system, and the printer, much smaller, lighter, and cheaper. It was intended for installation in single-seat fighter aircraft, where there is little space. Possibly also for the Ju-88 (ref. 8). Clearly, this Hellschreiber printer can only print the azimuth signal form the "Bernhard" ground station. There no longer is a pointer, previously formed by the V-shaped dip in the signal-strength track. One way to determine the azimuth, is to visually determine the azimuth value in the middle of the azimuth plot. This is not so simple. But what if the azimuth signal is not transmitted via the single-lobe antenna system of the Bernhard beacon, but via the twin-lobe antenna system? Now the signal strength of the azimuth data has a dip when the null of the twin-lobe radiation pattern sweeps by the aircraft! See Figure 64. Clearly, the operator had to do some interpolation. As a result, the achievable accuracy was reduced from 0.5º or 1º, to ≈4º (see p. 87 in ref. 2, p. 125 in ref. 21, line item 56 in ref. 8). This approach also implies a simplification of the Bernhard ground station: only one transmitter is needed, and the single-lobe antenna array is no longer needed. Note that this concept is already mentioned in the original 1936 Lohmann/Telefunken main patent 767354 and more explicitly covered by the Telefunken/Herbert Muth patent 767919 of December 1940. No photos, diagrams, or other documentations of this printer model are available. It does not appear that this printer, and the associated modified "Bernhard" ground station modification, ever went into service. 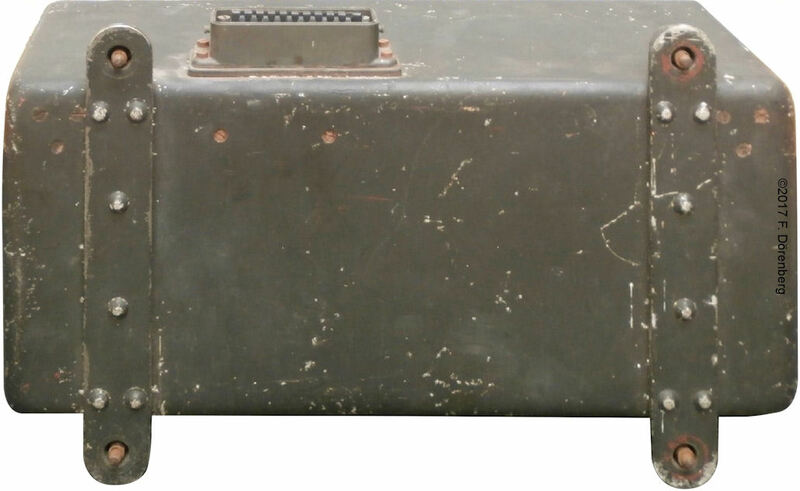 "BERNHARDINE" FOR FUG 139 "BARBAROSSA" AND FUG 126 "BALDUR/BORD"
FuG 138 "Barbara" was a small "Kommandoübertragungszusatz" command-uplink attachment to the FuG 25A "Erstling" Identification Friend or Foe (IFF) transponder in bomber and fighter aircraft. This transponder was used in combination with Freya and Würzburg radar systems, starting in 1941. The radar system included a transponder interrogation transmitter codenamed "Kuh" (125 ±8 MHz), and a "Gemse" receiver (156 MHz) to interpret the 10-bit reply codes of the transponders. Later in the war, the Luftwaffe developed the fighter control system "EGON": "Erstling Gemse Offensiv Navigation". "Barbara" could filter out Morse command messages that were superimposed onto the "Kuh" uplink transmissions. Major disadvantages of this system are that the enemy could also read the command messages, and that it required pilots to pay attention to the Morse signals ( = distraction) and know how to "read" Morse code (not part of standard pilot training). See §109-115 in ref. 8. Late 1944, the FuG 139 "Barbarossa" was developed to "to improve the interference immunity of the "Bernhard" system, as well as simplify and further develop it" (ref. 81), thereby also overcoming the weaknesses of "Barbara". Development started mid-1944 at an institute of the Reichsstelle für Hochfrequenzforschung e.V. (RHF) at Bad Aibling near Munich. "Barbarossa" was intended to work with the FuG 25A transponder and its successor, the Lorenz FuG 226 "Neuling", which was still in the prototype phase early 1945. Messages were uplinked to the transponder via Pulse-Position Modulation (PPM, a.k.a. Pulse-Phase Modulation), probably developed at Lorenz in Berlin or Falkenstein. This PPM used 30 μsec groups of three pulses. The position of the center pulse was varied in discrete steps, to encode information. PPM provides higher noise-immunity than Pulse-Duration and Pulse-Amplitude Modulation. Up to seven message uplink channels could be active on a single transponder interrogation frequency (ref. 82). 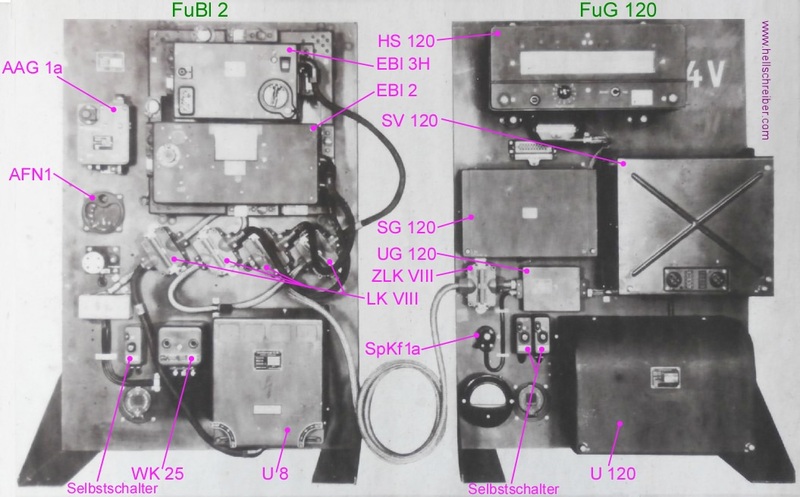 The "Barbarossa" system included a filter/decoder unit and a Hellschreiber printer. The printer was developed from that of the FuG 120 "Bernhardine". The filter/decoder unit comprised a tapped delay-line ("Koinzidenzsieb") and converted the PPM signals to Hellschreiber pulse sequences. The first production batch of 200 units (out of an order of 1700 units) was supposed to enter into service in April of 1945 (ref. 83). FuG 25 and FuG 226 were transponder systems that allowed the ground-station to determine the distance between aircraft and that ground-station (i.e., slant range). Only a small number of aircraft could be handled simultaneously by the system (and by the ground-controller). Clearly, this is incompatible with independent navigation by aircraft. Allowing the aircraft to interrogate the ground-station, rather than the other way around, solves this. The post-war implementation of this is the civil Distance Measuring Equipment (DME) system and the equivalent military TACAN system, both widely used to this day. The first (and only) Luftwaffe transponder system that worked like this, was the Baldur system. See §83 in ref. 8. It was developed during 1944 (ref. 26A). The system comprised the FuSAn 729 "Baldur" ground-based transponder transceiver, and the FuG 126 "Baldur/Bord" transponder-interrogator transceiver onboard the aircraft. A further development of this was "Baldur K". The onboard FuG 126K system included a Bernhardine-type Hellschreiber printer. The printer Psch120"k" of the FuG 120k, and its manufacturer. Involvement in the development of the Psch120/FuG120a by the Lorenz company in Falkenstein/Thuringia. Was the original April/May 1941 RLM order for 2000 HS 120 printers maintained, or modified to a smaller quantity when 2400 Psch120 were ordered in August 1941? Confusion Psch 120 vs. Psch 120a. Functionality/purpose of the PschMg 120. Hellschreiber of the FuG 139 "Barbarossa" and of the FuG 126k "Baldur K / Bord". Hellschreiber of the Lorenz "Sägezahn" command upload system. The color of HB 50 printer ink. Below is a listing of patents related to Bernhard/Bernhardine.